Arek and I stood above the roaring river, smack in the center of an old wooden footbridge, yelling our gameplans into each other’s ears. The bridge connected what the river separated—the historical Kingdom of Bohemia, now the Czech Republic, to the historical Kingdom of Silesia, now Poland. 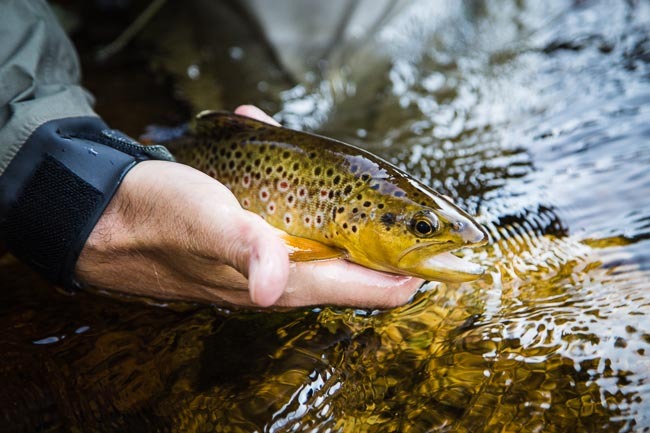 We were that summer not kings or dukes but trout wastrels, unmonied personages just one or two stages of desperation away from building flies with facial hair and dried sausage, the only things we had in real abundance. We were taking a gamble on this stretch of river, quite a ways downstream of the protected, catch-and-release water we had fished the year before. There were several reasons why this beat might not hold trout. It might have gotten the bejeesuz poached out of it. 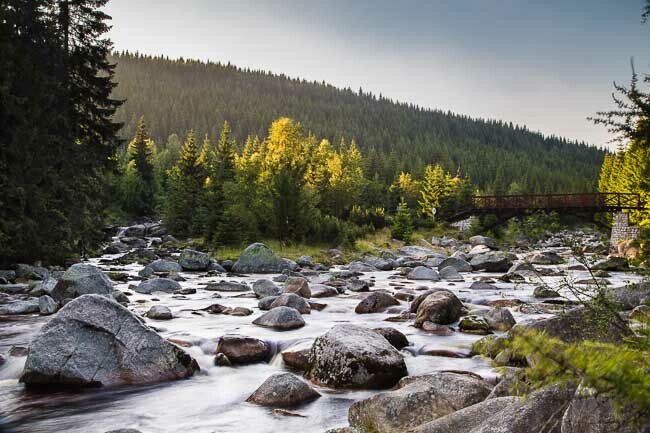 It might not yet have recovered from the decades of acid rain resulting from the toxic Soviet-era factories that had belched soot and worse into the valleys for decades. Or it might just be plain too inhospitable a piscatorial environment, running in places at a speed somewhere between sluicing and skull-smashing. But it was beautiful, empty of human life, and within hiking distance of a mountain hostel where we could stay for very, very cheap. This meant a lot, since my funds were low to the point that I had paid for my last stay with a four-weight. “We should try not to fall in,” I yelled, but Arek was already mountain-goating down the bank and did not hear. A fishless hour of mostly mountaineering with a touch of actual angling passed, and Arek announced he’d head back to the hostel to see if his girlfriend had arrived, leaving me alone to solve the system, or at least perfect my tinnitus. 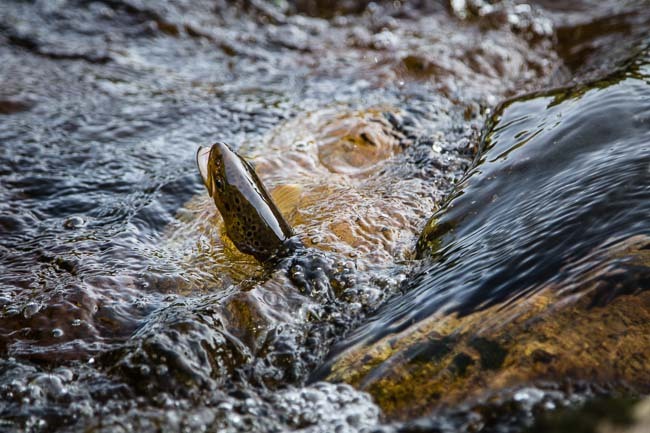 I changed tactics from leaping to looking, picked a parcel of water and stared at it long enough to glean a pattern in the chaos: a thumb-sized trout rising to mite-sized caddis in a plot of calm water the breadth of a ping-pong ball. “All of them,” I said, holding my hands shoulder width apart. “I’m as shocked as you are,” I replied. A GoPro, of course, would have told a different story. My DSLR would have offered an only circumstantially related account. Both would have been liars. That’s because a technically honest account of the fish—“15 fish, none over 12 inches”—which would have been terrifically dishonest account of the fishing, which felt to me, catching wild, native browns in the land of my ancestors, like the apotheosis of just about everything. And it was at that moment of truth-telling that I finally resolved a dissonance I’d been suffering from for years, ever since the days of listening to my Uncle, a raconteur of the first order, describe his experiences of pike fishing in the river sloughs and bayous of Northern Wisconsin. My brothers and I had feasted for years on his stories of monster fish with mouths so thick it was only by falling backwards in the boat that you could drive the hook home, pike who fought like demons from hell, wrapping line around logs and lily pads and his Evinrude prop and only rarely succumbing to the net, which was sometimes torn to shreds. Then one day, after listening to his stories for years, he finally showed us their visual addendum—a stack of photographs full of skinny, underlong pike. Where were the fish he’d been describing all these years, we wanted to know? “Those are them,” he said, beaming proudly. “Big ones.” We looked over them again before feeling a wave of betrayal. We took our uncle for, if not a liar, then a exaggerator. My Uncle had expressed to us a purer truth, had shaped his stories to hew with utmost fidelity to his own personal experience of fishing, which after several months of pining in his East Chicago machine shop, felt exactly like he described. And now I understand quite clearly that on certain days the experience of fishing is only explicable through the language of hyperbole, that what might look like lying is actually the only way to advance otherwise incommunicable angling truths. I’m going fishing tomorrow. Ask me Friday how it was.